Whether you are looking for art suitable for displaying in your home or office or as a gift – or more personally an individualized Japanese tattoo design – we have thousands of names in Japanese designs to choose from. To learn more read on as we describe the translation process and the information we provide with each design. 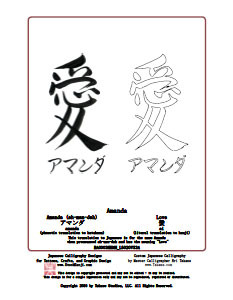 On the right is a translation of the name Amanda (ah-man-dah, amanda) to Japanese katakana written horizontally just below the meaning of the name Amanda which is Love (ai) which is the main character in this design. How Can I Be Sure This Is Correct? This is an important question and we have gone to great lengths so you can be completely confident with our translations. We do this by providing links to several reliable and independent sources including dictionaries, popular foreign movie sites, university research and when available Japanese Wikipedia links. For example, if you visit our order site Amanda (ah-man-dah, amanda) you will see links to an independent dictionary confirming the translation. We also show five celebrities currently using this translation and include links to the most popular Japanese movie website Movie Walker. With each name we provide as much support information as we can – we want you to be completely comfortable with the translation. And if you have any questions about any name you can always contact us with your questions. Translations You Can Trust Look up Amanda in Jeffrey’s J/E Dictionary at Amanda. People using this exact same translation are Amanda Donohoe (アマンダ・ドノホー), Amanda Gronich (アマンダ・グロニッチ), Amanda Peet (アマンダ・ピート), Amanda Schull (アマンダ・シュール) and Amanda Tapping (アマンダ・タッピング). The popular Japanese site Movie Walker also has at least one celebrity named Amanda that uses this translation to Japanese. The meaning of the name Amanda is from the Latin for “Love”. Confirm the meaning for yourself at Amanda on BehindTheName. Amanda’s meaning can also be confirmed on page 296 in The Comprehensive Dictionary of English & Hebrew First Names by Alfred J. Kolatch – a book we highly recommend. As you can see, we have gone to great lengths to provide accurate translations and we give you the resources to easily confirm the translation. With My Order What Exactly Do I Get? Well, there are three options. On the left is the PDF design suitable for a tattoo. To see, click on the design on the left. This is an actual design for Amanda with the meaning of Love. You will notice that this is a high-resolution image of Eri Takase’s hand-brushed art. The line art is vectorized so you can increase or decrease the size and the line art will remain crisp. We also offer the design as a digital graphic suitable for a variety of uses both commercial and personal. For personal use in crafts and for commercial use we offer the design in 72, 300 and 600 dpi JPG format. Finally, we also offer each design as original hand-brushed art that is personally created by Master Takase when your order is placed. So you can even order this designs as an original hand-brushed work of art! If you are looking for your name in Japanese for crafts, for your business or marketing, or for something as important and lasting as a personal tattoo design, then you will find no better source anywhere.